Drive Medical Raised Toilet Seat with Arms from HealthyKin.com fits most standard and elongated toilets. The lock ensures a tight fit providing additional safety and added feeling of security. The arms can be installed without any tools and can be removed or added as needed. A wide opening in the front and back allow for worry-free personal hygiene. The elevated seat will help individuals who need a boost sitting down or standing up from the toilet. 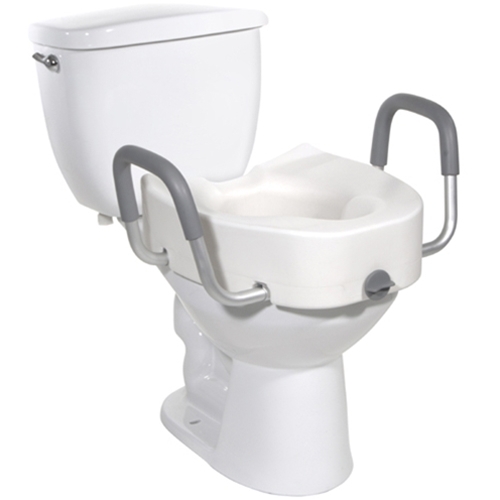 For consumers using a wheelchair this product allows for easy transfer to and from the raised toilet seat. The product is protected by a limited lifetime warranty. Order fulfillment was terrific. Product is pretty good. It does slip a little on my Kohler toilet. I just make sure I tighten it before I sit down.